Business Cards $10 per issue; $50 for six issues, 2” x 3 1/2”. Annual subscription is CAD $39.95 via PayPal or by mailing in a check if you prefer. Page size is 8 ½” x 11”. Supporting advertisements may be provided electronically as a PDF or uploaded with original photographs. Upload your advertisement or article in the spot provided. Photos, Art, Logos and business cards must be scanned at 200 dpi (B/W & 4 color - CMYK only) at least, 300 dpi preferred. Full page color ads should be at 300 dpi. All scanned artwork must be saved as TIF’s or JPEG’s. Note: You may also send us your original photo (color or b/w) and we will scan it and import into your advertisement. Contact us directly for mailing instructions. 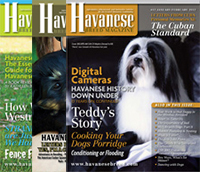 To subscribe to the Havanese Breed Magazine please go to this page http://havanesebreed.com/subscribe/ and fill out the form. It’s very simple and you are very welcome to join us. The Havanese Breed Magazine IS NOT RESPONSIBLE for the reproductive quality of emailed advertisements or photos. We will do the best we can with the material submitted to us.